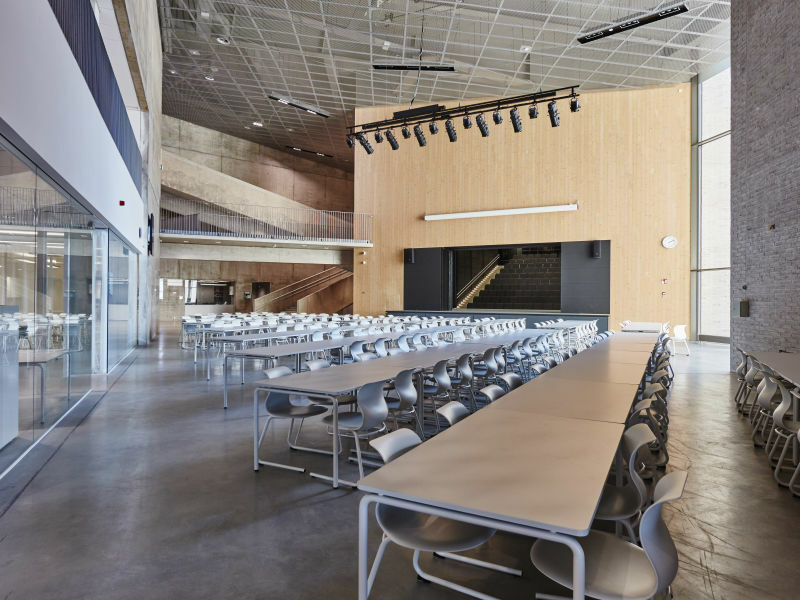 The new Opinmäki campus in Suurpelto, Espoo, Finland includes a kindergarten, primary school, and secondary school, along with premises intended for all residents to use, including an evening school, a library, cultural institutions, youth facilities, and a sports hall. The campus is also designed to support new teaching methods. 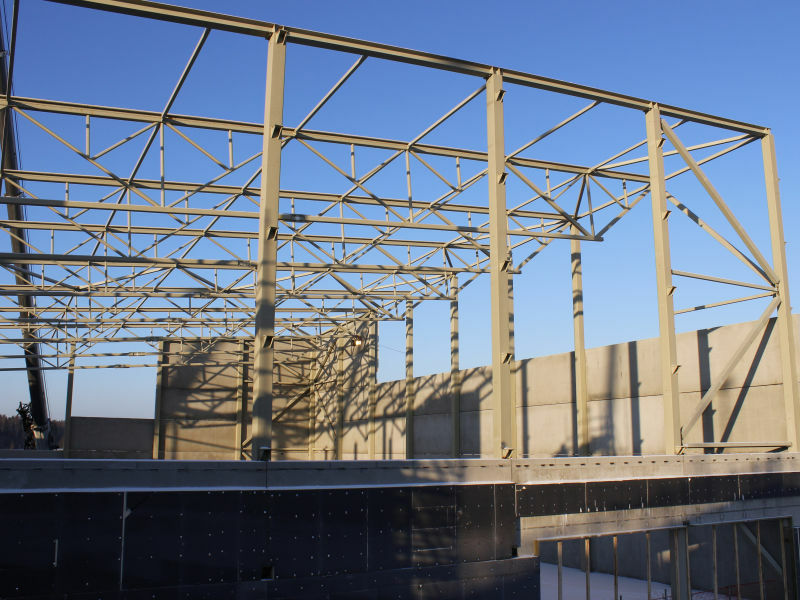 The main structures were built using the Peikko Composite Frame – Composite Columns and DELTABEAM® Composite Beams. The campus has an international school and a Finnish comprehensive school. These premises are used for evening classes outside of school hours. The schools utilize teaching methods that represent a clear departure from tradition: they are based on pupils' own activity and teamwork, and make extensive use of information technology. 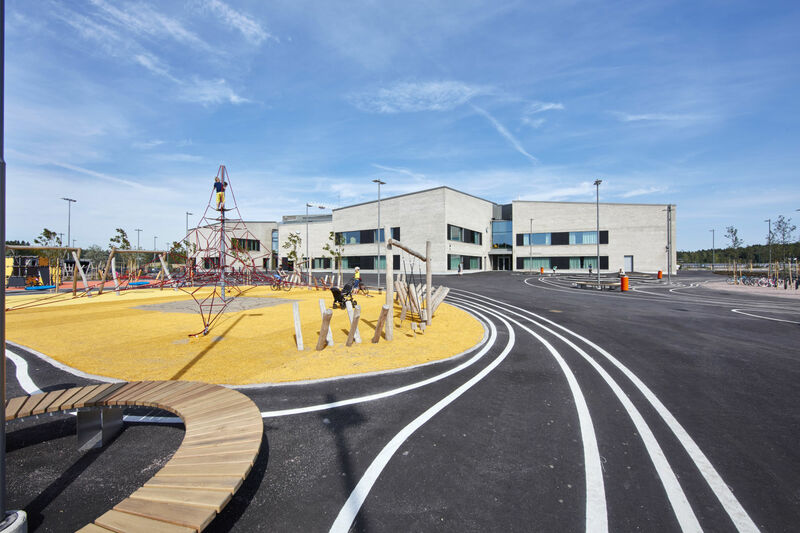 The building contains six units for kindergarten children aged 0–6, four primary school units for grades 1–4, and a secondary school, with premises for knowledge- and skill-centric teaching, a library, an auditorium, and sports facilities. The guiding functional principle was to divide the built entity into independent units that could all be accessed from the same lobby. 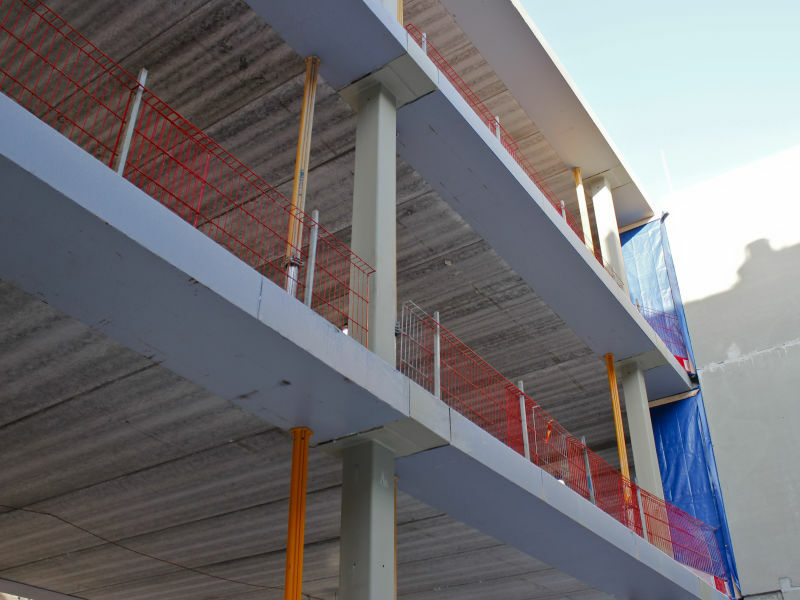 A building with a gross floor area of 16,700 m2 (180,000 ft2) is now under construction on the cramped lot. It has been designed in such a way that the building could still be extended to add another 5,000 m2 (54,000 ft2) of floor space. Ramboll became the project's structural designer in spring 2012. Jyrki Ketonen says that a composite structure based on steel columns and beams was selected as the solution for the main structure in summer 2012. "We prepared a design using WQ beams for the request for tenders. 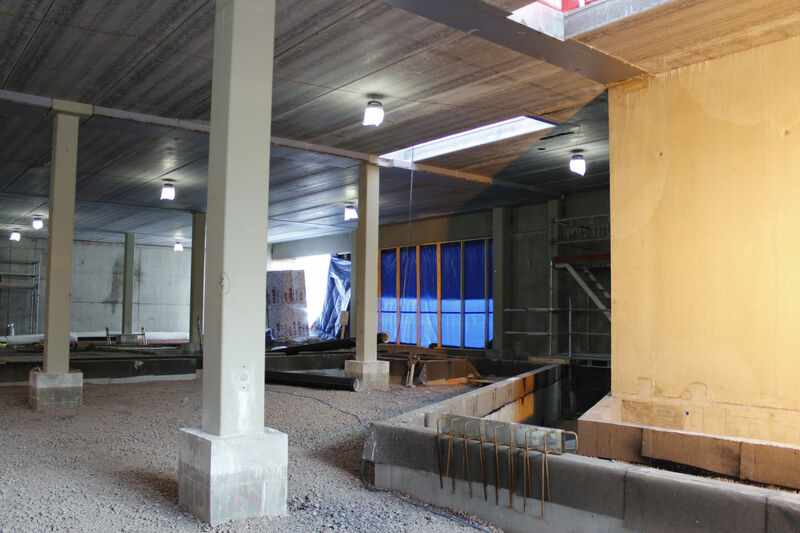 These beams were replaced by DELTABEAM®s when Peikko won SRV's tendering competition. The change had some minor effects on factors such as the size of the hollow cores but the majority of the designers' workload was due to the fact that the overall idea continued to develop throughout the design process. Of course, certain basic structural matters were confirmed at an early stage but a lot of time has been spent on communication. 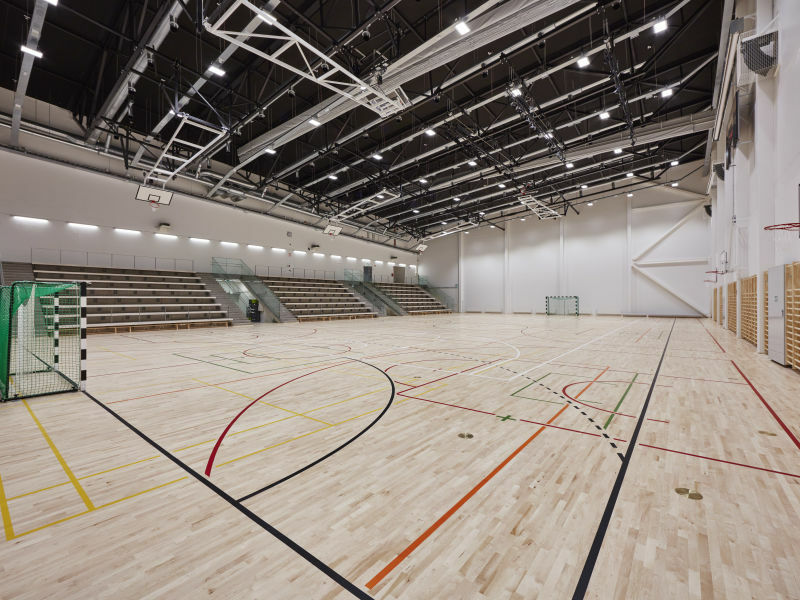 The changes, combined with the fact that there are nine different units, have represented a large workload for us to manage," says Ramboll Finland's Juhani Syrjä. 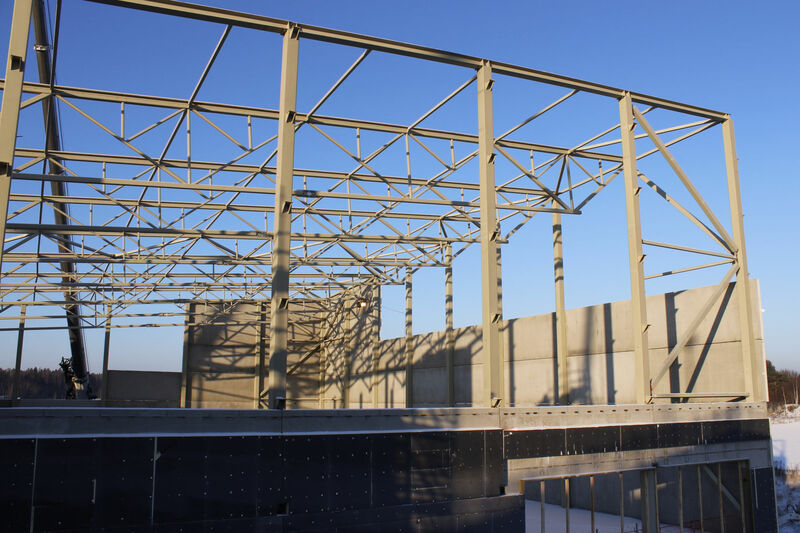 "Peikko was selected for this project because we considered their tender for delivering the steel frame to be reasonably priced. We received a large number of tenders from Finland and overseas but Peikko's tender was the best overall when all of the factors are taken into consideration. We did not want a solution whereby the supplier of the frame was also responsible for installing it because various work phases overlapped. 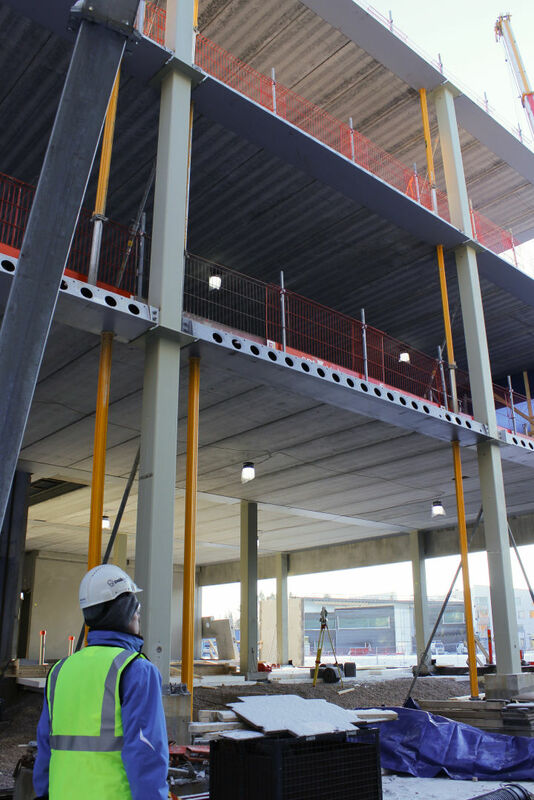 Now the installation has been a job in its own right and it has proceeded in accordance with the situation as a whole," says SRV Rakennus Oy's site manager Mika Myllymäki. SRV decided to submit a tender for the contract and the tender was successful. As requested by the client, SRV delivered a proposal for how the designs could be developed along with its tender. The proposal has led to some changes being made to the original implementation plan. For example, SRV proposed that the roof be implemented using prefabricated wooden elements. SRV's proposed changes to the designs have also enabled work costs to be significantly reduced in some areas. The campus has a mixed structure. 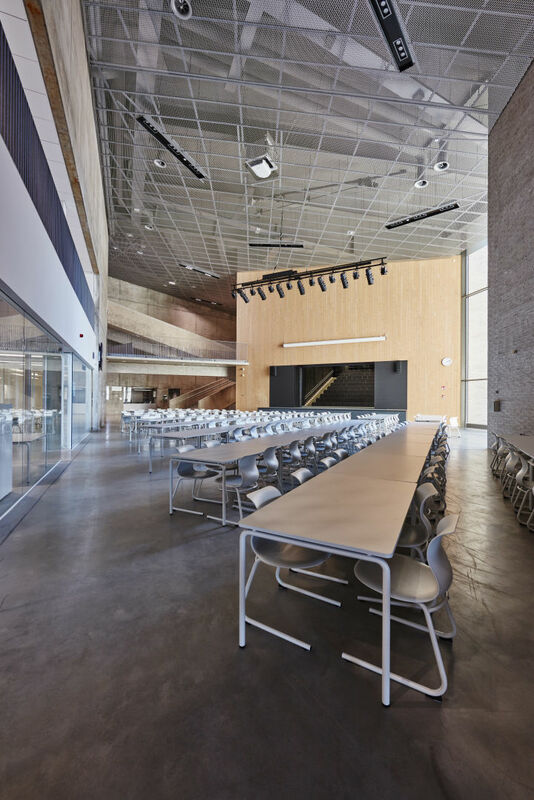 The buildings are made of steel, concrete, and glass, and the roof elements are made of wood. The column divisions, intermediate floor heights, trusses, and lines for building services had to be rejigged to form a functional entity. For example, the floor heights have been very carefully optimized. 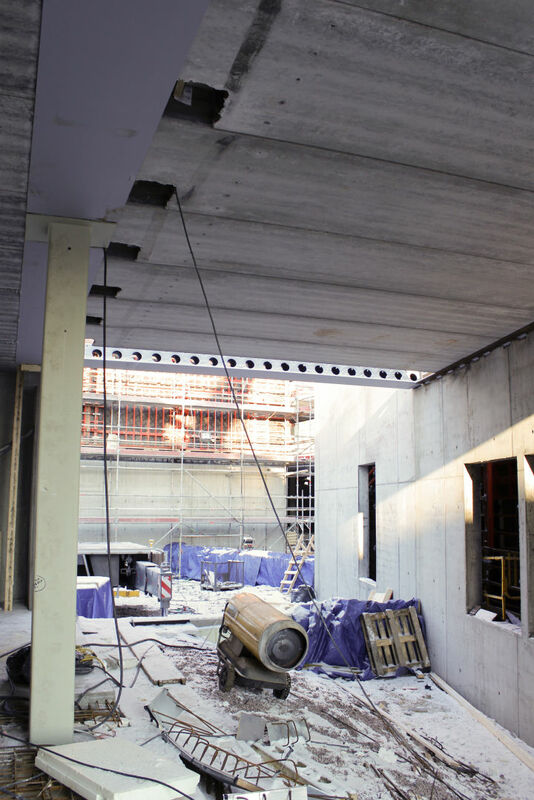 The composite columns supplied by Peikko are on the edge of the structure in the section containing the sports hall. The columns are between 15 and 21 meters (49 and 69 ft) long. In the sports section, spans have also been constructed using Peikko trusses that are 34 meters (112 ft) long and 3,600 mm (12 ft) high. These trusses have been installed diagonally. The air-raid shelter beneath the building was cast-in-situ. The remainder of the basement consists of a structure that is 4.2 meters (14 ft) in height and was made using Peikko's columns. 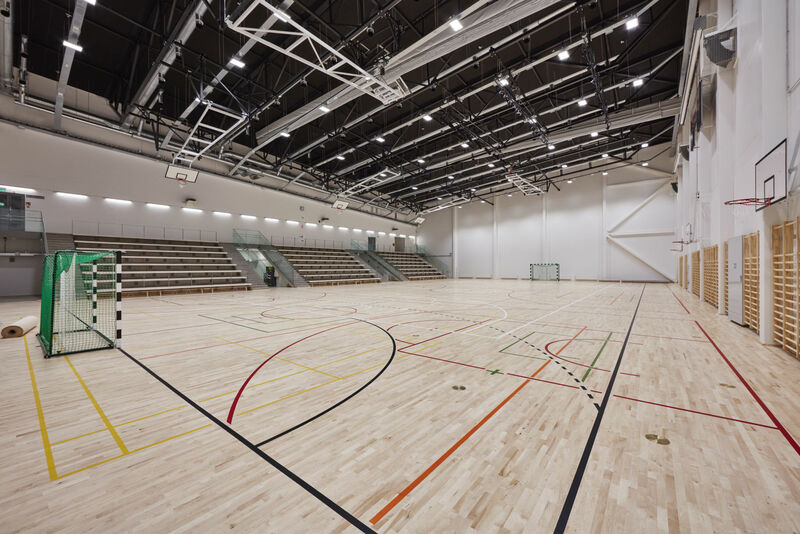 The intermediate floor (the sports hall floor) rests on DELTABEAM®s and hollow-core slabs. The size of the hollow-core fields is 6.6 x 7 meters (21.7 x 23 ft). The hollow-cored components and the DELTABEAM®s are 320 mm (1.1 ft) thick. 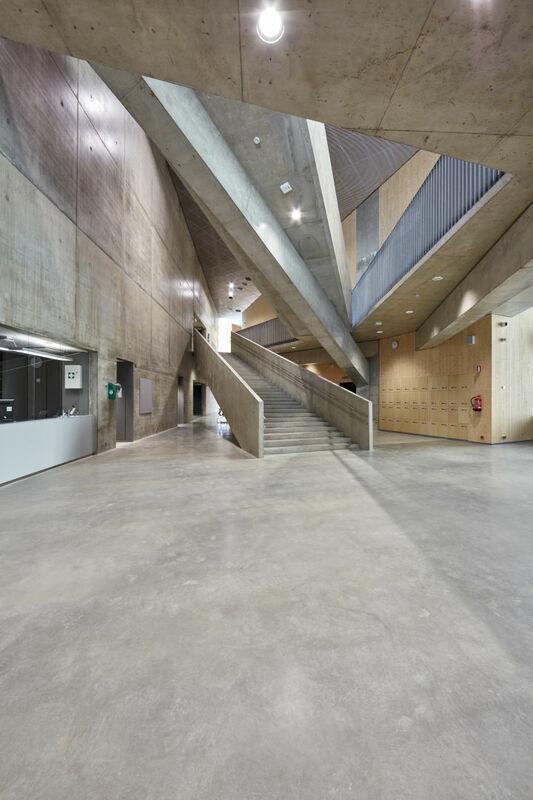 The building's envelope is made from non-load-bearing precast concrete elements. The building is stiffened using concrete stairwells and elevator shafts, as well as steel trusses. 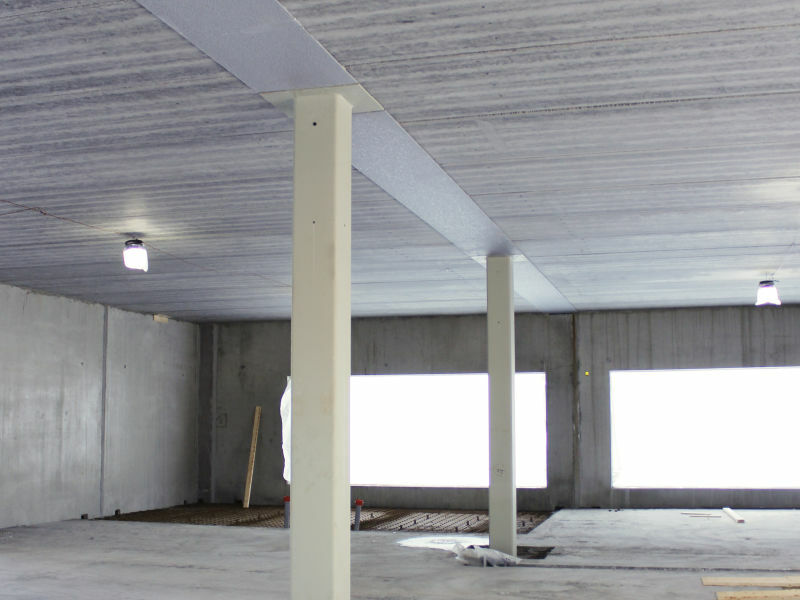 The roof houses a steel-framed ventilation machine room with a floor area of 500 square meters. The column divisions for the secondary school unit are based on 7–9-meter (23–30 ft) modules. 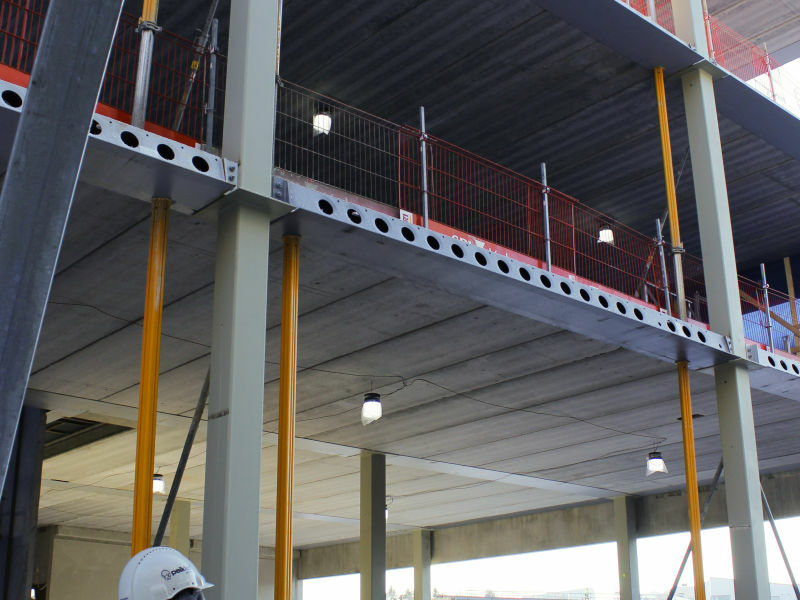 The composite structure was constructed using Peikko's Composite Columns, DELTABEAM®s, and hollow-core slabs. It supports a steel-framed ventilation machine room and unheated storage space, both of which are covered by the roof. The roof is made of prefabricated wooden elements that contain insulation and waterproofing. The elements are mounted on steel parts. The structure contains four stiffening stairwells. The two primary school units are also composite structures made using Peikko's Composite Columns, DELTABEAM®s, and hollow-core slabs. 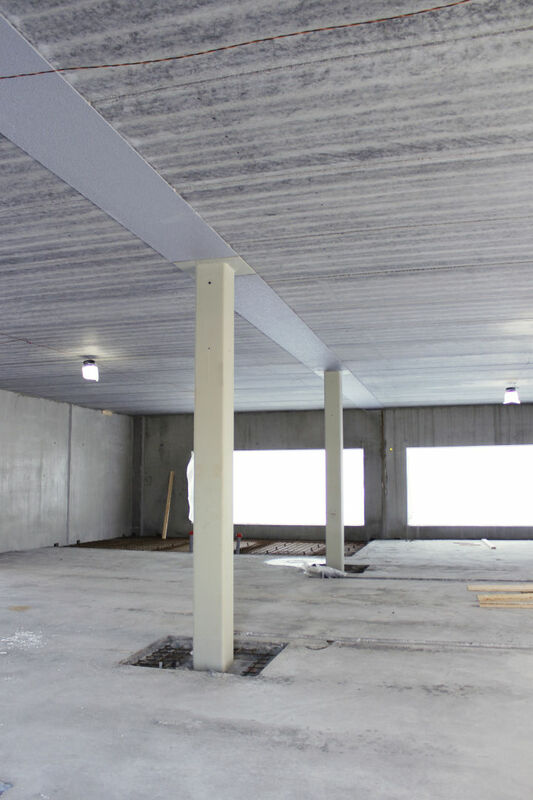 They have load-bearing, stiffing precast concrete elements for their external walls. Both buildings have two floors. Next to these is the cast-in-situ auditorium occupying a unit of its own with a steel-framed ventilation machine room on its roof. Three of the kindergarten units have frames consisting of load-bearing, stiffening external walls and hollow-core slabs. The fourth kindergarten unit includes a two-floored, cast-in-situ air-raid shelter structure with a steel-framed ventilation machine room on the roof. The frame of the lobby consists of steel columns and load-bearing steel sheets. The steel structures of the ventilation machine rooms and the steel columns that support the lobby roof were also supplied by Peikko. 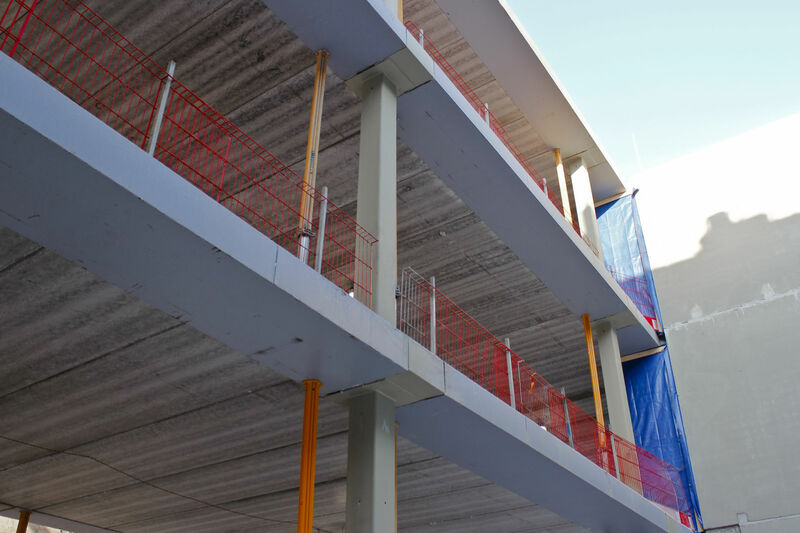 SRV has handled procurement for the Opinmäki campus construction site and is responsible for management and supervision. According to Mika Myllymäki, the project has remained within the stipulated cost limits and work will be completed to schedule on July 17, 2015. He calculates that SRV has made contracts with approximately one hundred companies for the Opinmäki campus construction site. In the same breath, Myllymäki says that splitting up the steel deliveries was never a consideration: all of the steel components were to be supplied by Peikko. Reliable deliveries and the ability to avoid unnecessary problems are important parts of managing the entity. "It is not a good idea to subdivide things too much. There is enough work for us to do due to the way in which the implementation plans have developed as work has progressed and the users of the building have occasionally had differences of opinion on how the premises should be realized. For example, as regards the premises specifications, it is necessary to closely monitor whether all of the desired factors have been included," Myllymäki says. SRV used product subassembly transactions to procure the DELTABEAM®s and roof structures for this site. In line with SRV's proposal, a roof structure consisting of wooden elements was mounted on top of the steel structures. This was quick to install and ensured that the structure was immediately water-tight. This product subassembly transaction also affected Peikko's delivery schedules as the roof solution necessitated changes to the steel frame. 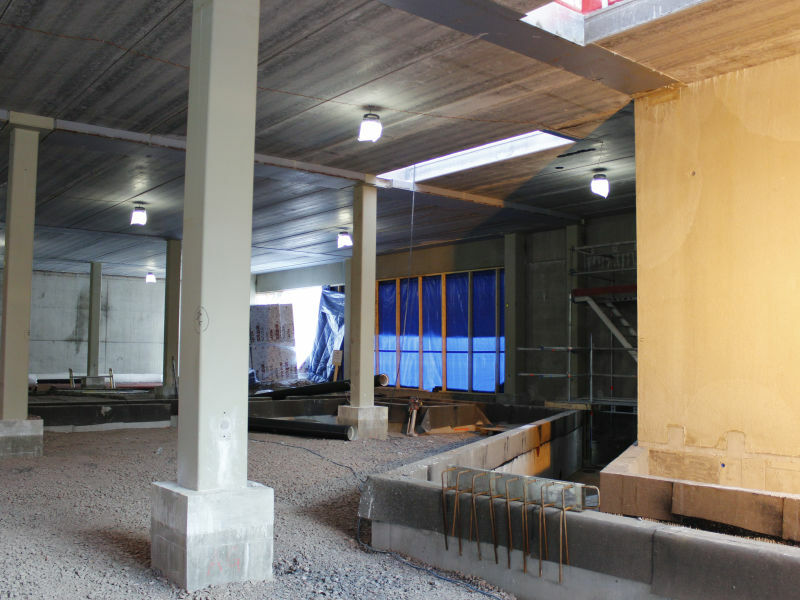 Jyrki Ketonen and Juhani Syrjä say that Ramboll carefully thought out the cast-in-situ components, precast concrete elements, steel columns, WQ beams, and various details and connections during the summer of 2013. At the same time, Ramboll also modeled the structure. When SRV selected Peikko as its steel supplier, the planning limitations changed. Designers from Ramboll and Peikko worked well together to ensure that the cladding beams do not have excessively long connecting parts. The end of the beam and the connection to the structure were made in accordance with Ramboll's designs. Jarno Backman says that the connections have worked well. 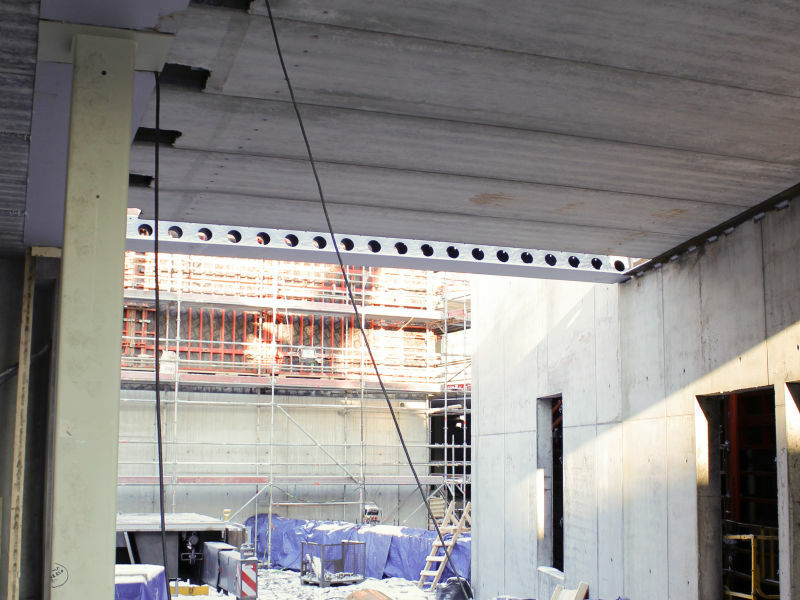 The DELTABEAM®s slotted smoothly into place even though the selected solution is different from the one Peikko normally uses. The steel frame of the Opinmäki campus contains a total of 12,600 different parts. There are 1,900 bolt groups in the connections. The frame contains 550 tons (606 US Tons) of steel, excluding rebar. DELTABEAM®s account for 160 tons (176 US Tons) of this. 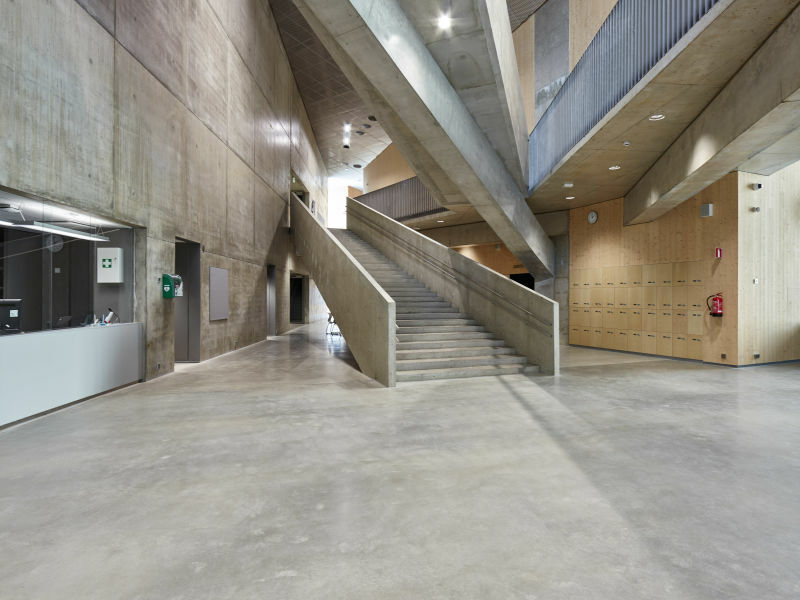 "Peikko also supplied a number of connections for the concrete structure but it was possible to use 'universal' data for these. In addition to this, Peikko has designed connectors of various sizes using data provided by other parties," adds Ketonen. Peikko was selected for this project because we considered their tender for delivering the steel frame to be reasonably priced. We received a large number of tenders from Finland and overseas but Peikko's tender was the best overall when all of the factors are taken into consideration. We did not want a solution whereby the supplier of the frame was also responsible for installing it because various work phases overlapped. Now the installation has been a job in its own right and it has proceeded in accordance with the situation as a whole.